The history of the Carbon County Arts Guild (CCAG) and Depot Gallery is dramatic. After the Guild's founding in 1973 by a group of ardent, enlightened citizens, it operated from the Carbon County Courthouse Annex building for five years. Over this five year period, the Guild acquired pottery and darkroom equipment, mirrors for dance classes and a bank account through fundraising events. The group was a genuine, enthusiastic group: sponsoring the Missoula Children's Theater in our area as well as the Shakespeare in the Park productions and providing classes introducing visual arts media to the community. Suddenly, a legal question arose in regard to the Guild receiving county support in the form of the use of the annex facility. The Courthouse Annex was evacuated and acquired art equipment was stored in scattered sites. For a brief period a shop was leased, but this space was lost also. Eventually, Ayers and Alterowitz Law Firm leased some office space to the Guild and rooms in private homes and businesses were borrowed for classes and activities. In the summer months of 1981 and 1982, the city permitted the CCAG to sub-lease a cabin from Red Lodge Historical Society for the purpose of providing a sales outlet for local visual artists during the tourist season. Amazingly the tenacious group managed to survive in spite of the continuous displacements. At last occurred a breakthrough! 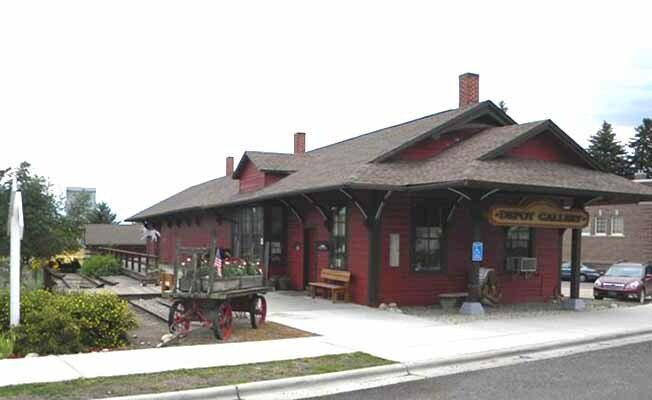 In 1982 after months of strenuous effort on the part of several dedicated Guild members, the Burlington Northern Railroad donated the old train depot to the CCAG with a lease on the land. Today, the dedicated and pioneering souls of the Carbon County Arts Guild maintain a vision focused on providing a rural cultural resource for those living in South Central Montana and Northern Wyoming. The altruistic cluster of artists and art patrons stand firmly with arms extended to several counties and community members of all ages. Realizing that creative knowledge speaks to the human spirit and its trademark qualities of perseverance and passion, the Carbon County Arts Guild thrives. The nonprofit organization not only touches the hearts and minds of the area citizens through the arts, but also forms a positive economic opportunity through the Depot Gallery and well-attended annual functions. An enlightening force feeds the human spirit which dances and flies on the wing of music, resides in the poetry of the written and spoken word, finds empathy on the stages and sees its humanity in the visual arts. The Carbon County Arts Guild and Depot Gallery is truly an enlightening force in our region. Original Art - very extensive display of works of over two hundred regional artists at a time, continuously changing. Ten major featured exhibitions every year. Annual Red Lodge Arts Fair, Labor Day, all art forms, sculpture pottery, jewelry, 3D. Call 446-1370.